A gallery may not be your go-to summer activity (though with the recent sunny spells they’re a great place to escape from the heat), but what about if that gallery is situated in the midst of one of London’s most famous parks? The Serpentine Galleries are located in Kensington Gardens, so they’re perfect for culture vultures who want to combine fresh air with fresh art, especially as they have a range of outdoor offerings to peruse, including their annual pavilion, and a very special outdoor installation in the middle of the Serpentine Lake! After a walk in the summer sunshine, there’s no better place to cool off than the Serpentine Sackler Gallery. Formerly a munitions depot storing gunpowder during the Napoleonic wars, the building is now a starkly white (and air conditioned!) space for displaying cutting edge contemporary art. Small, but perfectly formed, it’s ideal for people who just want a quick injection of culture, without having to get bogged down with too much reading and philosophizing (though in a very 21 Century fashion, you can download their app if you want more information). The Serpentine Sackler are currently running an exhibition of work by German artist and former Turner Prize winner Tomma Abts, who is well known for her abstract explorations of colour, form, texture and composition. Immerse yourself in her paintings that pop out against the white washed walls of the gallery, and marvel at the innovative displays of optical illusion like paintings on often interestingly shaped canvasses – some are asymmetric, or even cut apart and reconnected like jigsaw puzzles. Tomma Abts runs until 9 September at The Serpentine Sackler Gallery, West Carriage Drive, London, W2 2AR. Admission is free. Every summer, The Serpentine Galleries commission a new artist to design a structure or pavilion outside the Serpentine Gallery. This year, the pavilion has been created by Mexican architect Frida Escobedo, who has created a sturdy, grey, courtyard based design, that has been inspired by the architecture of her home country, as well as British materials and history. A shallow pool of water in one section of the pavilion is a key element, reinforcing desired themes of light and water, and allows viewers to consider their own reflections, and literally see themselves as part of the art work. The pavilion does not only act as a creative installation, but also plays host to a variety of summer events! Why not check out one of the community picnic talks Radical Kitchen: Recipes for Building Community and Creating Change which run on Wednesdays, or to learn more about the inspiration behind the pavilion, head to curator Joseph Constable’s talk and tour on 1 September. 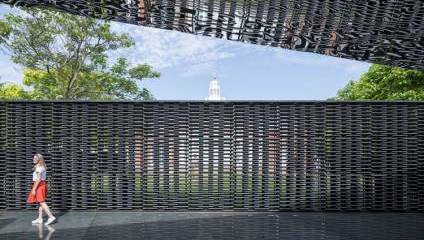 The Serpentine Pavilion is located at Kensington Gardens, Hyde Park, London, England, W2 3XA and is open until 7 October 2018. The London Mastaba will up until 9 September 2018 and is located on the Serpentine lake, Kensington Gardens, London.